This little scooter features steerable front roller as well as "engine" sound from ping pong balls (or any other item of your choice) inside the roller wheels. This little car is actually a puzzle that "explodes" into individual pieces when its front bumper stikes anything. The "exploded" car can then be reassembled (the puzzle) for another adventurous "crash". 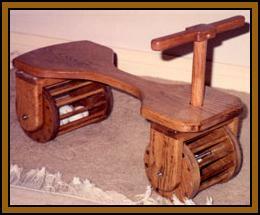 This small rocking horse is designed to hold a small toddler and rocks back and forth. This little doggie rolls on wheels that animate the legs to simulate a running dog. It can be pushed or towed on a "leash". 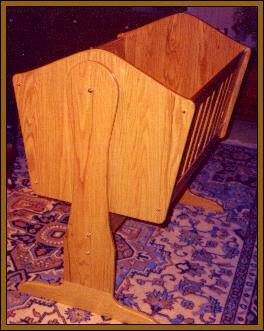 This handmade cradle is mounted on a sturdy stand that allows it to be hand rocked. 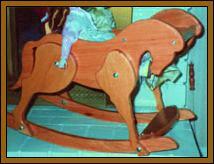 This rocking horse is designed for infants to small toddlers and is very stable.The horse is hand painted. 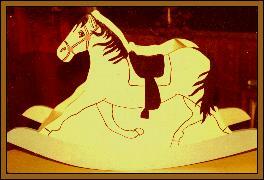 Any item can be constructed of any wood and finished in any stain or paint of your choice.